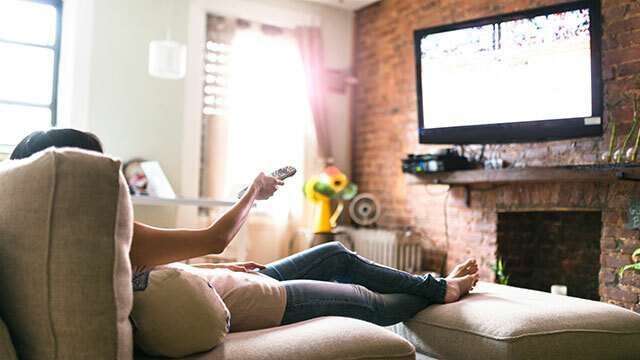 With the average cost of cable running $1,284 per year, it’s no surprise that more and more people are making the decision to cut the cord and get their TV fix elsewhere. But can you really still watch all the shows you love without paying the price of a hefty cable package? Yes, you can. Here’s how to watch TV without cable. You can view videos or full episodes from many of your favorite TV shows for free on network websites. Broadcast channels like ABC, CBS and NBC offer a wide range of on-demand episodes, as do cable channels like TLC, TBS and HGTV. Just head to your favorite network’s website to check out what’s available. One major complaint about alternative TV services is there typically isn’t much offered for sports fans. Sling TV by Dish Network is one solution. It offers live access to up to 52 premium channels, including CNN, Comedy Central and TBS. That said, it’s live access; there’s no option to record a show you want to watch later unless you add on the Cloud DVR for $5 extra per month. Cost: $25/month for the Sling Orange and Sling Blue plans, or $40/month for a combination of the two. You can find 10,000 episodes of CBS shows with CBS All Access live streaming. Available for your PC or mobile device, it also gives you access to live TV and special features like the Big Brother live feed when available. Cost: Free one-week trial, then $5.99/month for limited commercials or $9.99/month for commercial-free access. The basic subscription is ad-supported, but you can upgrade to Hulu’s ad-free plan to watch almost everything commercial-free. Hulu also offers a Hulu + Live TV plan that gives you access to more than 50 channels and up to 50 hours of live TV recordings in addition to the streaming features of the basic subscription. Other add-ons are also available for additional fees, including HBO, Showtime, Starz and more. Cost: Free 30-day trial, then $7.99/month for limited commercials, $11.99/month for commercial-free or $39.99/month for Hulu + Live TV. This streaming service offers hand-picked, heartwarming and family-friendly movies and TV series. Hallmark Movies Now is commercial-free and available on a wide range of devices from your iPhone to your Roku to your Xbox 360. It also offers originally produced short films and programs, as well as an exclusive collection of Hallmark Hall of Fame features. Cost: $5.99 a month or the annual plan for $59.99 ($4.99/month). Commercial-free and available on a number of platforms, Netflix has one of the largest libraries of shows and movies available for livestreaming. It releases whole seasons of shows at once — great for binge-watching but not so great if you want to be up-to-date on your favorite shows so you can discuss them with your friends. You’ll have to wait for the latest season to end before you’re able to watch it on Netflix. Cost: Now $9/month for the basic plan, $13/month for HD and $16/month for the 4K plan. If you’re addicted to HBO shows like “Game of Thrones” and “Girls,” you’ll find they’re not available on other streaming services. If you want to watch them without renting countless seasons of DVDs, you’ll want to get HBO Now. It’s available for most devices — tablets, laptops, phones and desktops, but not video game consoles — and offers a 7-day free trial. Or you can opt for the HBO add-on with your Hulu subscription or your Amazon Prime subscription. Cost: Free 7-day trial; $14.99/month after that. The list is by no means exhaustive, and you’ll find it doesn’t have the most recent seasons of currently running programs. You do have the option to buy a TV season pass for about $10-$20 or pay around $1.99-$3.99 per episode to view additional shows. If you already buy a ton of stuff from Amazon and can benefit from the free two-day shipping that comes along with Amazon Prime, it’s certainly an option worth considering. Cost: Annual subscription for $119 ($9.92/month) or $12.99/month. Go old school and hook your TV up to an HDTV antenna to get basic broadcast channels with a high-quality picture. Add a TiVo or other DVR device and you’ll be able to record shows to view them later. Find out which channels are available in your area and the best antenna for your needs at AntennaWeb.org. Cost: $35 and up for the equipment. Go really old school by checking out the offerings at your local public library. It’s not enough to satisfy the die-hard TV fanatic, but if you’re looking for a cheap way to pass a rainy day, you certainly can’t beat the price.